When politicians propose a new policy, such as Barack Obama’s and Hillary Clinton’s plans to outlaw one third of US CO2 emissions in the next 15 years, it is always worth asking: Has this been tried before? And what happened when it was? The answer is: a much, much milder version of the Obama-Clinton plan has been tried in Germany—and it has already impoverished millions. Over the last decade, Germany has pursued the popular ideal of replacing reliable fossil fuel energy with unreliable energy from solar and wind. 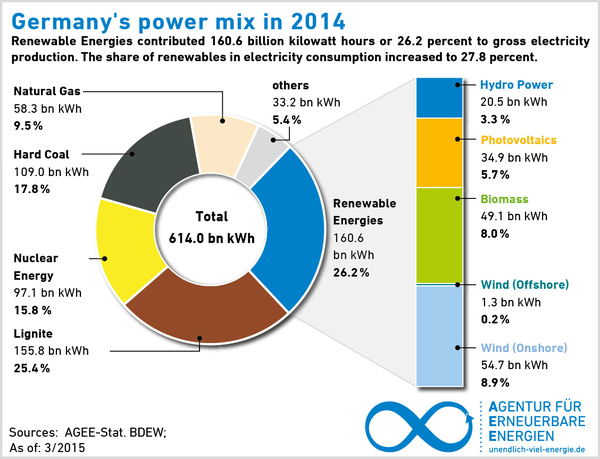 Since unreliable energy can’t be relied upon—as Germany’s own data show below—they have to be propped up by reliable energy. What kind of reliable energy is providing the life support? Most of the time, it’s fossil fuel energy: energy harnessed from the Earth’s copious, untapped supplies of ancient, dead plants in the form of coal, oil, and natural gas. You would think that our President and any candidates would want to avoid anything to do with the German experiment. Instead, they want us to double down on it many times over. When Obama and Clinton talk about outlawing 1/3 of CO2 emissions, which they euphemistically call a “goal” or “target,” and making up the difference with unreliables, they expect you to believe that, say, putting solar panels on half a million roofs, a scheme Clinton proposes to force taxpayers to finance, will readily do the job. But consider this: despite Germany’s world-leading spending on solar and wind, because unreliables require life support from reliables, its coal capacity is at a record high—and CO2 emissions haven’t dropped since 2008. We have no idea what kind of horrors would await us if we do what Obama and Clinton propose—but we can be sure that they could make the gas lines of the 1970s look like a period of energy plenty. The justification for all of this is to “fight climate change” by reducing CO2 emissions. If the increase of CO2 in our atmosphere from .03% to .04% were a serious problem, the most direct way to tackle it would not be to force us to use unreliables, it would be a dramatic scale-up of nuclear power plants, which are the only scalable form of electricity besides fossil fuels—and which emit no CO2 and no air pollution. Yet Clinton’s “clean power plan” excludes nuclear and Obama’s plan barely includes it—indicating that they, like the green organizations that support them, are not anti-pollution or even anti-CO2, but anti-development. But more fundamentally, increasing the amount of CO2 in the atmosphere from .03% to .04% has not caused and is not causing catastrophic, runaway global warming. Dishonest references to “97% of scientists” equate a mild warming influence, which most scientists agree with and more importantly can demonstrate, with a catastrophic warming influence—which most don’t agree with and none can demonstrate. Several prominent scientists have, for the last 4 decades, been predicting catastrophe if we kept using fossil fuels. In 1985, Obama’s science advisor John Holdren predicted that by now we’d be approaching a billion CO2-related deaths from famine. Instead, malnutrition has decreased 40%. Billions more people are fed, and fossil fuels are a big reason why: diesel-based machines farm more efficiently than ever, natural gas fertilizers grow more crops than ever, and oil-based transportation makes more farms than ever accessible. And it’s not just agriculture: fossil fuels make every aspect of life better, because they provide the cheapest, most plentiful, most reliable energy on the largest scale—meaning that billions of people can use machines to become more productive and prosperous. In the US, where we have innovated with technologies such as shale energy, which enables us to use once-useless rocks to charge our iPhones, run our cars, and power a growing manufacturing sector, fossil fuel energy has saved us from a far worse recession. We should be doubling down on this technology. We don’t need a “Clean Power Plan”—a euphemism for a blackout plan, which supports unreliable technologies while also ignoring the genuinely dirty mining processes used to build solar panels and wind turbines and batteries, and the process of disposing of their toxic elements once they stop working after 10 or 20 years. We need a plan that liberates all the energy technologies, including fossil fuels, and letting them compete to the utmost to provide the most affordable, reliable energy for the most people. We need an Energy Liberation Plan.